A US police officer who forcibly arrested a nurse for refusing to take a blood sample from an unconscious patient has been placed on administrative leave. An investigation is under way after footage of the incident at a hospital in Salt Lake City, Utah, emerged. 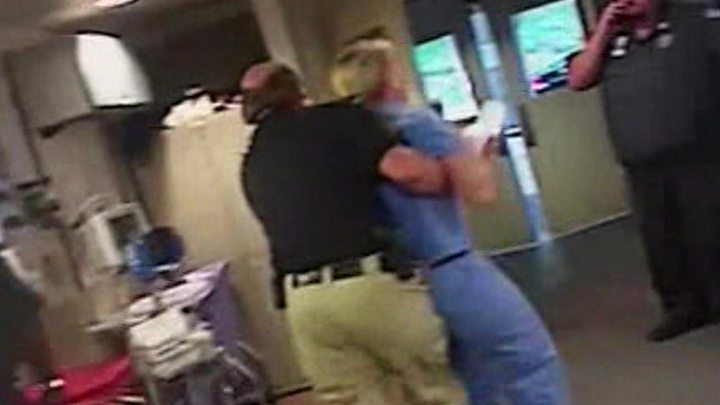 It shows nurse Alex Wubbels screaming for help as she is manhandled outside and handcuffed. The hospital said she had correctly followed its policy. Blood can only be handed over without a patient's consent if they are under arrest or the police have a warrant - neither of which was the case in this incident, the University of Utah Hospital said. Salt Lake City Police Department said both the officer involved and another police department employee had been placed on administrative leave pending the investigation. The incident occurred on 26 July, but the video was only made public on Thursday at a news conference held by Ms Wubbels. "The only job I have as a nurse is to keep my patients safe. A blood draw, it just gets thrown around there like it's some simple thing. But blood is your blood. That's your property," she told reporters. Ms Wubbels said in a subsequent statement that the city's mayor and police chief had both apologised to her over the treatment she had received, and that she had accepted their apologies. Salt Lake City police chief Mike Brown has said he was "alarmed" by the footage, while city Mayor Jackie Biskupski described the incident as "completely unacceptable". The University of Utah said it supported Ms Wubbels "and her decision to focus first and foremost on the care and wellbeing of her patient". It added that it had created a new policy on blood samples that barred officers from coming to the hospital in person to seek them.